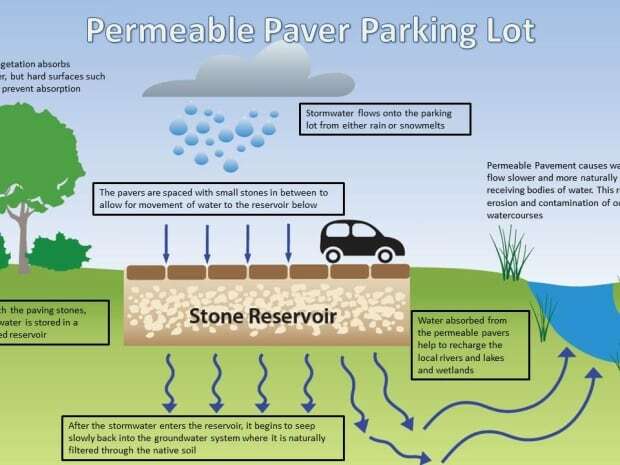 Increasingly we are seeing more and more creative ways that permeable paving can be used to manage stormwater and associated problems like erosion and nutrient leeching. For example, this article here (opens in new tab) shows a council in Canada trialling a permeable parking lot. It’s a great illustration of how councils are realising the importance of naturally draining stormwater, rather than running it off into drains and waterways. We recently exhibited at the HIA Home Show and met lots of visitors who needed permeable paving. From architects specifying permeable paving, to builders and new home owners needing permeable driveways installed. Some particularly interesting enquiries were from people wanting to use our permeable paving to collect stormwater. We can include agi pipes (slotted drainage pipes) in the sub base, that collect and direct groundwater. These could then potentially be fitted off to a buried water tank for future use. The real beauty of this is that the permeable paving and permeable concrete would act as a filter and sediment trap – where as if the same system was to be replicated with a concrete driveway, you’d wash everything straight off the driveway into the tank. We always enjoy a challenge, or an unusual application for our paving – so if you’re thinking of something that you can use our paving for, don’t hesitate to get in touch with us today!